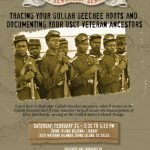 The International African American Museum will present free genealogy programming every Saturday in February. 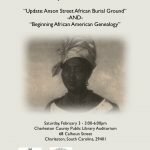 Saturday, February 3: Gullah Society and IAAM | CFH present “Update on Anson Street African Burial Ground” and “Who Are Your People? 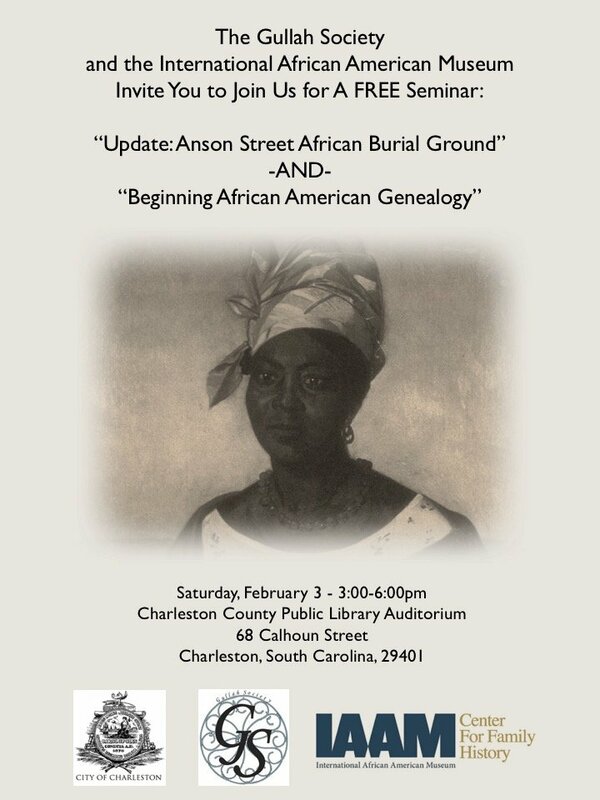 Beginning African American Genealogy” at the Charleston County Public Library Auditorium, 3pm-5pm. Saturday, February 10: Bernice Bennett, host of the BlogTalkRadio show Research at the National Archives and Beyond, will present “Discover Your Ancestor’s Journey in Civil War Pension Files” and “Guess Who’s Coming to Dinner? Connecting the Dots Through DNA Research” at Edisto Hall at James Island County Park, 1pm-4:30pm. Sponsored by the Charleston County Parks and Recreation Commission and IAAM | CFH. 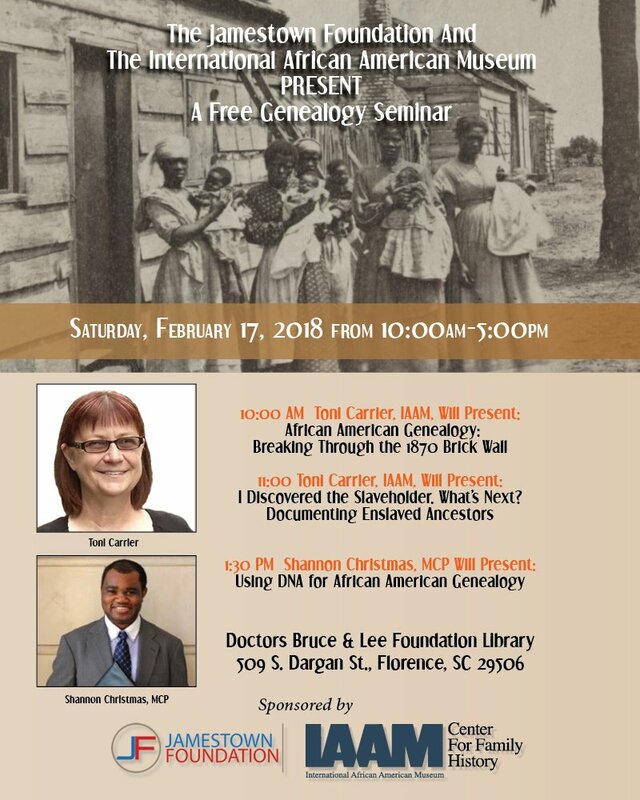 Saturday, February 17: IAAM | CFH will present “Breaking Through the 1870 Brick Wall in African American Genealogy” and “I Discovered the Slaveholder. What’s Next? 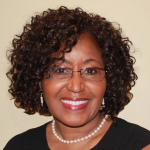 Documenting Enslaved Ancestors.” Shannon Christmas, MCP will present “Using DNA for African American Genealogy” at the Doctors Bruce and Lee Foundation Library, Florence, SC, 10am-5pm. 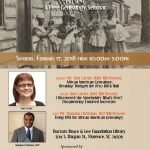 Sponsored by the Jamestown Foundation and IAAM | CFH. 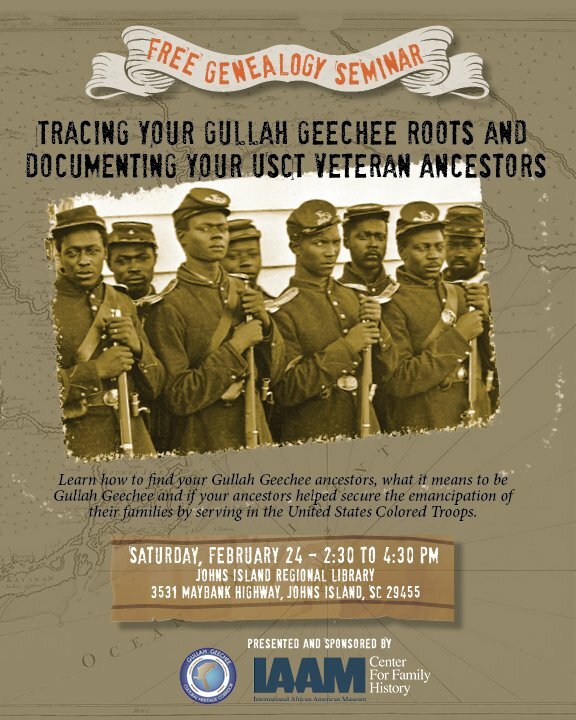 Saturday, February 24: IAAM | CFH and The Gullah Geechee Cultural Heritage Corridor will present “Tracing Your Gullah/Geechee Roots” and “Documenting Your USCT Veteran Ancestors” at Johns Island Regional Library, 2:30pm-4:30pm. All events are free and open to the public. Join us for one, or come for all!